Currently, CTEMPs has 3 Field Deployable DTS (FD-DTS) systems that are complete, stand-alone systems capable of running on solar power or 110/220 VAC. These systems are designed for harsh environments and can be configured with a variety of data storage and upload capacities. In addition, CTEMPs maintains 3 other types of DTS systems, one designed primarily for 110VAC power accessible environments, with less harsh environmental conditions (Sensornet Halo) and two high spatial and temporal resolution instruments (Silixa XT and Ultima). The Center also has access, on an as-available basis, to several DTS systems operated by OSU and UNR. CTEMPs has also developed a power pulse contoller for heating fiber optic cables. The Center has 2 units available for lease. CTEMPs at OSU has 2 cargo trailers equipped with 1260 W of solar panels each. Please contact the Center to determine if these systems are available and fit your needs. See Instrument Lease Rates for a complete list of available equipment and costs. Priority will be given for standard deployment periods (6 weeks) for these instruments. Oryx DTS with 5km range and operating software. 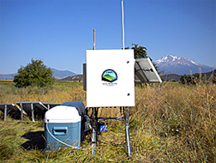 The system can be configured with 5 Crossbow/eKo remote weather stations, each with precipitation, solar radiation, wind speed, temperature and relative humidity sensors. Also included is a 3G compatible cell phone data link via Verizon network (SIM card provided) or on-board data storage. The system is enclosed in a weatherproof shelter. The standard system is shipped to operate on 110VAC. The system can be equipped with 200 W solar panels for power in most applications (user must provide two 70 amp-hour deep discharge batteries). Deployment includes stand-alone temperature loggers (e.g. Tidbits) and reader, standard calibration bath coolers and mixing pumps. Contact CTEMPs for application requirements for this system (Silixa XT or Ultima). Contact CTEMPs for deployment options and availability. The CTEMPs Power Pulse Controller is designed to provide easily controlled pulses of electrical power. The electrical power pulses are intended for use with armored optical fiber cables. The controller is designed to operated with either 120V AC or 240V AC with a maximum amperage of 30 A. Up to four cable sections can be heated on a programmable schedule. Contact CTEMPs for application requirements for this system.